Question: “I have a customer who wants motorcycle wheels masked and the inside done with a flat black, then he wants the whole wheel covered with a clear. I’ll do the black then remove the masking, here is my question, do I leave the black in for a couple of minutes to setup, remove the wheel, remove the masking (which can take five to ten minutes), then coat the clear then put it back in the oven. Or do I let the black fully cure then put on the clear. There are a few common misconceptions on some of the forum boards online, so let’s try to clear this up for everyone. You read many times that you simply bake the first coat for a few minutes and then apply the second coat. That is NOT accurate….ESPECIALLY is the first coat is glossy. If the first coat has a very high gloss or a mirrored look, bake it at least 75%, LET IT COOL, and apply the 2nd coat. If it’s not a high gloss, bake it at least 50%, LET IT COOL, and apply the 2nd coat. I can already hear some folks now saying “You can’t let it cool. It’s better to apply hot. It’s impossible to coat the 2nd coat cool”………blah…blah….blah. Inability to coat a 2nd coat cool has zero to do with the science of powder coating. It’s all because the person applying the powder simply does not know HOW to do it correctly. Not trying to step on toes here but the truth is the truth. Coating a 2nd coat hot, especially on a clear or a candy/translucent color is a VERY BAD IDEA. You simply cannot control the thickness. The part will have spots that are different shades, all due to the different thicknesses of the top coat. Sorry to get off on a tangent from the original question but I get phone calls all the time from people who have gotten advice from some “online expert” with zero credentials and most of it is garbage. “Clean parts with thinner and a rag”, “2nd coats have to be done hot”, “sandblasting is the only pretreatment needed” etc. get me ticked off. The misinformation that is out there is staggering. These are the people that give our industry a bad reputation because they are creating very poor quality finishes which do not hold up to their potential. Eventually, enough people will gain enough knowledge that the inferior shops will die off. As for our classes, we don’t actually do them every month. About 8 times per year currently. In 2012, it will probably only be about 4 or 5 large classes per year in our training center. We will also be doing other classes on other subjects then as well, including (hopefully) an advanced class for custom coaters. We are also working out the details for our World Tour that would include a free one day seminar on Making Money in a Powder Coating Business. Any feedback on what you guys think of this idea would be appreciated, or anything else you’d like to see a class on. 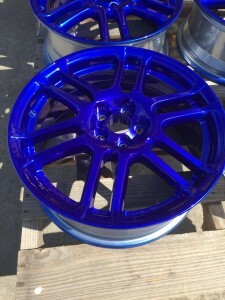 Powder X Coating Systems, llc.